Three Things That Help Me Stay Chill During Exams!! I know a lot of my blog audience is between the ages of 18-24 which means most of you are in university doing exams right now! Exam time can be super stressful and I have a few things that really help me get through the exam grind so I thought I'd share. This kind of goes along with the Diffuser except for a different purpose. I don't know about you guys but since exams are so stressful I definitely stay up through the night most nights studying. I hate the florescent lights so I light a bunch of candles and turn on little lights! My favourite candle company is actually Canadian which I LOVE. 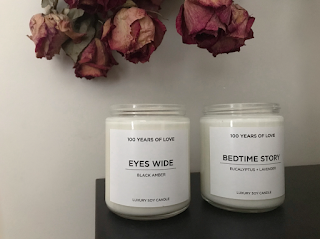 The company is called 100 Years of Love and their candles are not only really cute but they smell so yummy too. I think I've already talked about this mask on the blog before but here I am again. TRUST ME I've tried out every mask on the market. The Alya Skincare mask is the best one I've tried so far. It refreshes and moisturizes my skin but it doesn't feel heavy like some other masks do. It's affordable and really high quality. Also I like that the mask lasts a while too. Thanks for posting about hathaspace. Their air purifiers look awesome too!